Four Surveyors of Caesar: Mapping the World! 1) In this article you will hear about the masterpiece of cartography which highlights most of the men responsible for the Survey of the known World, along with aspects of Roman land surveying which underpinned the program of colonisation and settlement within the Roman Empire. The article is an excellent contribution to the FIG Working Week 2012 in Rome, Italy. “Rome was not built in a day!” This well cited saying could be equally applied to the survey of Rome and its many outskirts of centuriations radiating from the nucleus of the central square. This being so it was clearly to take many years in the field by the four Greek Surveyors charged by Julius Caesar to chart the entire known world. Through exhilarating research I can tell you how long this task took as well as the names of the surveyors who carried out the survey plus the coordinator commissioned with the duty by Octavian himself ! The story behind the Survey of the World varies between scholars but one version of the tale is brilliantly retold in text and images in spectacular fashion on the legendary Hereford Mappa Mundi (dated to c. 1290-1300). All references credit Julius Caesar with making the initial decree to make a survey of the whole of the Roman World in conjunction with his closest consort Marc Antony sometime around the year 45-44 BC. Knowing that in March of 44 BC (at the Ides of March to be precise) he was assassinated it is possible that a written order could have been delivered by the adopted son of Julius Caesar, Octavian, to the surveyors to confirm his concurrence with the original action or the representation of this alleged royal order on the medieval map could be merely the whim of its creator. Octavian’s greatest general (later to become his son-in-law ! ), Marcus Vipsanius Agrippa, was appointed as the overall supervisor of the great mapping project which was more than probably not finally completed until some years after his death. There is a growing number of scholars such as my friend Michael Ferrar favouring a date 10 years earlier for the start of the Great Mapping Project but as there are so few sources (two in fact!) which have reported on the years associated with the exercise I will place my reliance on the times nominated by Julius Honorius, the first and oldest extant report on it. In this paper you will hear about the masterpiece of cartography which highlights most of the men responsible for the Survey of the known World, along with aspects of Roman land surveying which underpinned the program of colonisation and settlement within the Roman Empire. I will also give you with the name of the cartographer responsible for this brilliant piece of late thirteenth century mapping together with the history of the historic repository where it was rediscovered many centuries after its disappearance. It is still housed in the Cathedral from which it derived its name today thanks to some most generous benefactors and enthusiastic heritage fanatics. It is a truly incredible revelation that we have the approximate commencement time of the survey of the entire ancient world and just how long the arduous exercise took but to ponder that we even know the names of all of the people involved in the awesome undertaking is staggering to the imagination. Well get ready to be thrilled; get ready to be amazed because I am about to transport you back to a time of majesty and conspiracy closely followed by an extended period of peace during which four Greek Surveyors took on the survey of the world and actually did it! To be given the commission to survey the world sounds like and certainly is a monumental contemplation but this exact responsibility was bestowed upon four “extremely learned men” by the most powerful man in the world at the time of this momentous instruction – Julius Caesar ! There are some unsubstantiated sources which purport that this great emperor himself first started his career in the ranks of the army as a surveyor of the roads of Rome, legendary for their straightness and right angled intersections but I must leave the verification of this exciting possibility to future investigation while I mesmerise you with this true tale of epic surveying during the era that it is said the streets of Rome were paved with gold ! The entirety of the known world at that time (45/44-13/12 BC) included Asia, Africa and Europe, with many portions of these continents under the occupation of the Roman Empire, a not insubstantial expanse of territory in anyone’s imagination ! The late 4th/early 5th century Roman historian Julius Honorius states that the entire earth (“omnis orbis”) was surveyed by four surveyors of Greek extraction who were selected by Julius Caesar and his co-consul Marc Antony. Contemporary accounts about these surveyors refer to four such “most able men” but later reporters erroneously drop one of the agrimensori in favour of only three men of measurement, which slightly contorted tale has been adopted on the Hereford Map. Initially I am going to give a brief outline of the training and techniques which would have been instilled into the men entrusted with surveying tasks during the Roman Empire along with the calibre and expertise of the highly regarded Guild of Experts from which four were chosen to do the ambitious bidding of their imperious leaders. Even in the very early days when Romans were predominantly a nation of farmers they had a mythical obsession with the land to which they attributed great antiquity. 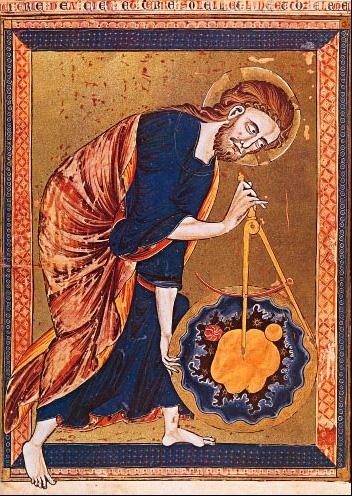 The Roman Surveyors were known as “agrimensori” (literally “measurers of land”) or “gromatici” (“users of the groma” – which is an ancient Roman surveying device consisting of a cross mounted on a bracket, fitting into a staff, with a plumb bob hanging from each of the four ends to enable the laying out of straight lines at right angles to each other). Thus the Roman subdivision of land known as centuriation carried on the tradition of the Egyptians and Greeks before them of laying out towns and land parcels in orthogonal patterns with parallel streets intersecting at ninety degrees mainly comprising allotments of rectangular shape. The line drawn around a town was referred to by Virgil as sulcus primigenius (“the original furrow”) and was monumented with boundary stones according to Tacitus and Plutarch. Actual boundary stones have been discovered at Capua placed during the Second Triumvirate bearing inscriptions “By order of Caesar (Octavian), on the line ploughed”. 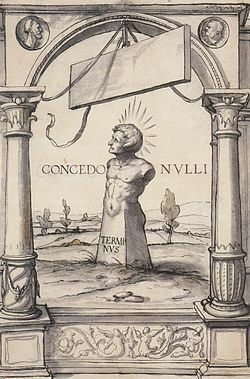 The Romans even had a god called Terminus - God of the Boundary Stones closely affiliated with the principal deity Jupiter. Indeed it is the Romans who introduced the Feast of Terminalia during which the Town Consul and his officials would walk around the town bounds beating drums to ward off evil spirits, a ritual which survived down through the centuries into the modern era when statutes required the enactment of “Beating the Bounds” in an identical style to designate the extent of the town limits outside of which legal jurisdictions changed. During the 1830’s in New South Wales the same concept of boundary stones was laid out under The Police Act where the town limits were delineated by imposing boundary monuments. In Sydney and Parramatta it was required by this legislation to conduct an annual beating of the bounds in a reenactment of the Roman event. In Parramatta the whereabouts of eight of the original nine boundary stones are known. The Roman land surveyors did not only measure the land, they laid it out with more careful planning and more precisely than by any other nation at any time until the late eighteenth century ! With methodical and practical purpose the Roman surveyors of Caesar prudently began measuring from the Augur’s starting point then set about the laying out of the streets and allotments of the new town which always had two main roads intersecting at right angles at the heart of the establishment. The first line to be laid down was the principal street called the decumanus maximus which would be the widest thoroughfare running in a north-south direction with the secondary street known as the kardo(cardo) maximus intersecting in the centre of the main road at right angles thus orientated towards the east and west. feet with the cross street set at a lesser width of 20 feet and a centuriation stone cylindrical in shape bearing the engravings “DM” and “KM” with double lines intersecting on the top of it was placed at the centre of the centuriated area. 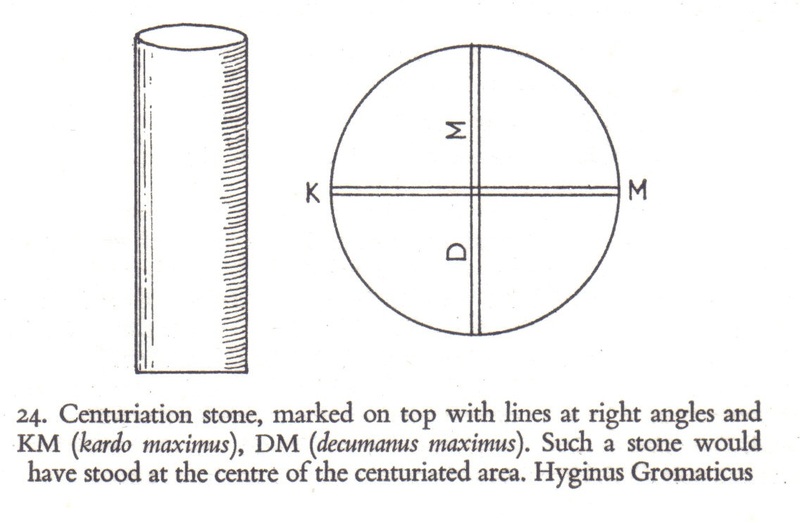 Some of these road intersection monuments were made of set out at right angles using a groma (see figure 2) the distances were measured with 10 feet long rods (decampeda) and carefully checked. It has been well shown through the examination of many archaeological sites that even the interconnecting highways between towns were also planned and surveyed before their construction. The supreme precision of the levelling achieved in their thousands of kilometres of aquaducts stand as a proud memoriam to the accuracy and skill of the ancient surveyors. There are many areas typical of the centuriations laid out by the Roman surveyors with a specific fine example existing in the Orange Cadastre of France both over the landscape and shown on engraved stelae. 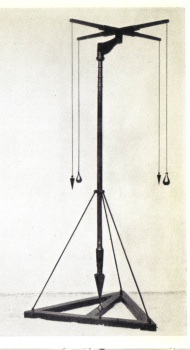 Surveying equipment still used in 79 AD was found in the Surveyor’s Workshop of Verus (or Vero) at Pompeii in 1912. Among the artifacts discovered were the metal pieces of a groma, a portable sundial, a folding ruler with one fold, 1 Roman foot long, 2 bronze compasses, the bronze parts of two wooden chests used to store fieldbooks and drawing implements, pincers (9 cm long), a conical ferrule (6.2 cm in length), 16 long, thin iron tools, an ink bottle and stylus. At the National Archaeological Museum in Naples there were displayed three plumb bobs said to have their origin in Pompeii along with some of the aforementioned items. The metal end pieces of a measuring rod were also unearthed at this fabulous World Heritage site. Hero also refers twice to the utilisation of tautened ropes or cords for the measurement of longer distances. In 55 BC Julius Caesar passed agrarian land reform legislation known as the Lex Mamilia part of which has been preserved within the Corpus Agrimensorum, a series of texts copied through the centuries by the hands of the monks attached to the scholastic religious monasteries renowned for their libraries of antiquarian knowledge. This legislation which laid down conditions for the law associated with boundary disputes was still in force 140 years later when Frontinus wrote of its provisions which specified penalties for offences against it as well as for removing or altering the position of boundary stones. There were particular conditions set down for any land disputes within five (5) feet of any subdivision boundaries and the agrimensore (surveyor) had ultimate jurisdiction over internal land boundaries in addition to the landward limits with adjoining colonies which whenever possible were set upon natural features like rivers or mountains. As well as surveying, parcelling and allocating land the mensor (measurer) had to ensure that boundaries were properly established and marked out – the technical terms for this being terminatio or determinatio. 4. Samnites, Marsi, Paeligni, Sabines etc. It is said that these above divisions remained with very little alteration right down to the time of Constantine the Great who was Emperor between 306 and 337 AD who really must have treasured his surveyors because he exempted them from paying tax! 3. SURVEYORS – THE ULTIMATE LAND EXPERTS! Alright, we have hundreds of years of Roman adoration of the land administered through strict legislation and established legal precedence which were the sole dominion of the cadastral (land) surveyor, but did this situation last after the Fall of the Roman Empire in 476 AD with the conquest by Odoacer, a German Chieftain ? With the original stone construction from the 7th century destroyed after 200 years by Aethelred of Mercia the subsequent reconstruction by Edward the Confessor lasted for only a handful of years till it was sacked and burnt in 1056 by an army of Welsh and Irish forces led by Gruffydd ap Llywelyn. 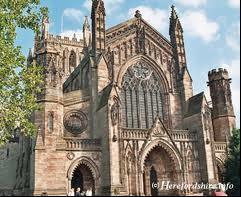 The current Hereford Cathedral was built within the ruins of the last one in 1079 not too long after the Norman Conquest of William the Conqueror in 1066. Situated in the County of Herefordshire the full name of the holy building is the Cathedral Church of Blessed Virgin Mary and St. Ethelbert in the Diocese of Hereford designed in the Gothic style. The final additions were commissioned by Bishop Aquablanca in the mid 1200s being completed later in that century under Bishop Swinfield. Within the Cathedral in the late 1800’s found in a storage room was a medieval Mappa Mundi which had formerly hung on the wall of one of the shrines for hundreds of years. Having been masterfully penned around 1290-1300 by Richard of Holdingham, identified as Richard de Bello (of Battle), he is said to have been the prebend of Lafford (modern day Sleaford) in Lincoln Cathedral around 1278-1283. Later he became an official of the Bishop of Hereford, when in 1305 he was appointed prebendary of Norton, and a Canon in Hereford Cathedral. His life after 1313 has not been traced but his date of death was c. 1326. Richard even tells us directly that he was the one who created the masterpiece with an inscription in the bottom left hand corner. He is also probably the individual on horseback situated in the bottom right hand corner looking towards his declaration. The horse rider has also been suggested as Paul Orosius, another 5th century historian but proof of the identity has not been verified. It is reported by various sources as well as being supported by a prominent inclusion within the Pentagonal Frame of the Hereford Mappamundi at the left right hand side that the measurement of the whole world was ordered by Julius Caesar “to be made by four very wise and chosen men,” and that “this measurement was begun in the consulship of Julius Caesar and M. Antonius.” It is also said that “three Greeks were appointed for this purpose, Nichodoxus, Theodocus, and Polyclitus” which is the version that is represented on the Hereford Map with the names of the three surveyors also shown as Nicodoxo, Teodoco and Policlito in red ink around the perimeter of the map. Indeed there a number of variations of each of the names of the measurers of the world of differing origins including Nicodemo/Nicodoxo/Nichodoxus/Nichodomo and Nicodoso for one, then for the second individual Theudoto/Teodoco/Theodocus and Teodoto with only minor alternatives for the third member of the group as Polyclito or Policlito. The fourth surveyor mentioned in earlier manuscripts such as the Vatican MS from 1209 is said to be Didymus or Didymo who is alleged to have been entrusted with the survey of the western regions which were known as “Occidentalis.” It is unsure just what occurred to exclude this fourth man from the team but his duties are said to have been relegated to Teodoco who is depicted on the Hereford Chart to have measured the north (“Septentrionalis”) and the west (“Occidentalis”). Installed to oversee this phenomenal project was the brilliant young general Marcus Vipsanius Agrippa who was only aged 19 at its commencement having been born in 63 BC, the same year of birth as Octavian (later to become Caesar Augustus). At the time of the assassination of Julius Caesar in 44 BC he was studying with the future Roman Emperor at Apollonia. He was later to marry the sister of his Emperor as well as gaining victory in many notable battles against the fleet of Pompeius followed up by the critical overthrow of Antony at Actium in 31 BC which provided the mastery of Rome and the empire of the world (which was still being surveyed!) to Octavian. In 26 BC the Senate bestowed the imperial title of Augustus upon Octavian. With as much of the information available to him at the time Agrippa is said to have started a contemporaneous Map of the World for his Emperor. His appreciative leader is said to have completed the map himself and had it engraved on marble for later placement in the colonnade built by Agrippa’s sister Vipsania Polla. Along with this world map Agrippa is said to have written a lengthy treatise on the cosmography of the known world containing a comprehensive compilation of the places surveyed on the known earth by his trusted team of Surveyors. The final World Map referred to by Pliny the Elder early in the first century AD is likely to have been this map. The existence of such a map has been attested by various sources including Strabo. I am sure that by now you will want to know the answer to one question: “Just how long does it take to survey the world ?” Well it is scarcely believable, but we do know EXACTLY just how long it took to “measure the world.” From Julius Honorius the four Surveyors of the Roman World completed their allocated duties in the following periods: Nicodemus measured all of the east (“Oriens”) which took him 21 years 5 months and 9 days while the southern colonies (“Meridiana Pars”) were the sole obligation of Polyclitus occupying his time for the longest period of the four at 32 years 1 month and 20 days. It is stated that Didymus measured the west (“Occidens”) over a time of 26 years 3 months 17 days and the north (“Septentrionalis”) was determined by Theodotus over a period of 29 years 8 months. Thus the full task was completed between 45/44 BC and 13/12 BC, possibly in the year of Agrippa’s death at the young age of only 51 !!! Perhaps the receipt (if these dates are possible!) of the final survey information was too much excitement for him! With regard to this precise timing of the completion of the Survey of the World it has been suggested to me that this would not be accurate as they used a different calendar at that epoch of history. Well these timings are compatible with our modern collations of time as the modern calendar which we use today was adopted by Julius Caesar on 1 January in 45 B.C. with twelve months consisting of 365 days and an extra day every four (4) years being the leap year to catch up the one quarter of a day overlap caused by the earth’s orbit around the sun. It would not be coincidental that only two of the months are named after Roman Emperors, July and August, reflecting the most significant contributions made by these two giants of the Roman Colossus to its preeminence in the ancient World, not the least of which was the incredible exercise of surveying it! 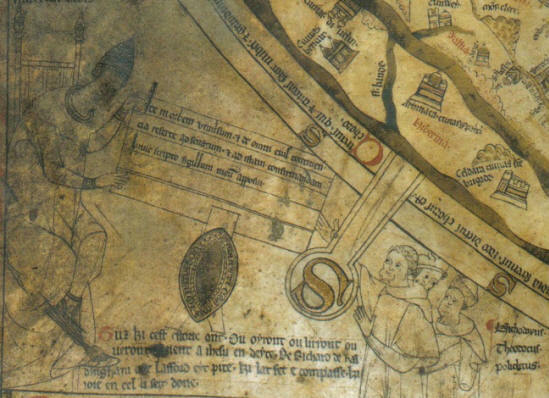 The medieval cartographic masterpiece known as the Hereford Mappamundi was estimated to have been completed in about 1290 to 1300 AD and is currently housed in the magnificent Norman era cathedral which gave the work its name in the west of England. The map is of the genre T-O typical of the religious style of mappamundi of this period such as the contemporaneous St. Beatus Map (c.1050), Psalter World Map (c.1265), and Ebstorfer Map (mid-late 13th century). Shown as a flat circle surrounded by ocean the known world comprised Europe, North Africa and the explored section of Asia with the horizontal bar of the “T” dividing Europe from Asia and the vertical line being the Mediterranean Sea. Such maps were religious concoctions with the Holy City of Jerusalem occupying a disproportionate area of the chart at the centre while the Earthly Paradise was placed at the top of the map which was actually the Far East. Thus we have north on the left and south on the right. The base for the masterpiece was the traditional vellum which was treated calf skin even used during the early period of Land Titling in Australia. Even though the mappamundi has exaggerations and some misrepresentations driven by religious preoccupations it nevertheless pays an extensive level of detail to the depiction of geographically and historically authentic information illustrated in a most artistic and masterful way. The material portrayed on the Hereford Map is declared as being based upon Orosius’ History of the World itself heavily reliant on the earlier writings of The Bible and Pliny the Elder who was killed at the Vesuvian eruption which buried Pompeii in 79 AD as witnessed by his nephew Pliny the Younger. According to Meryl Jancey in the “Mappa Mundi – a brief guide” the purpose for crafting the great map was as a medium of religious awe to encapsulate in a spectacular visual way to a vastly illiterate congregation the wonders of man and the natural world which were attributable to the Almighty God. The figure of Christ, the Virgin Mary and a few angels near the top of the map at the Day of Judgement gave the bemused civilians a path to salvation through which they could extract some solace for their existence. The majority of the writing on the map is in black ink with red and gold leaf for emphasis while blue or green was used for rivers and seas. One exception is the depiction of the Red Sea in red colouring. Scalloped patterns showed mountain ranges with towns identified through the walls and towers of the local structures found within those places. In addition to the man-made features unique to an area which had been described by the visiting surveyors and world travellers the known regions of the map are situated by their geographical elements and natural features. However when the lands are unknown for authentic detail mythical creatures and beings are drawn to make the plan a mixture of fact and fiction. Most locations bear icons representative of their identity such as the Pyramids and Sphinx for Egypt, and, of course, Hereford indicated alongside the River Wye by the drawing of the Cathedral which bears its name. Engravings and illustrations displayed on the historical map provide a most exciting chronicle of the Surveying of the World Project first proposed by Julius Caesar in about 45-44 BC with decorative inscriptions and even sketches of three of the four Surveyors of Caesar including their names beside them. This antiquarian world map portrays the later version relating to the formation and execution of the scheme assembling its citations and images based on the account of the Survey of the World by Paul Orosius from the 5th century which omits the surveyor of the West, Didymus. Between the outside circular delineation of the major oceans and the perimeter of the map edge is said to be The Pentagonal Frame. Within what appears to be a vertical text box which then slopes upwards at about 45 degrees at the top left of the map inscribed in red capital letters is the declaration that: “The terrestrial landmass began to be measured under Julius Caesar.” The next similar pronouncement on the top right hand side of the chart and sloping at a similar angle downwards says: “Nicodoxo measured all the east.” The next vertical and horizontal writing at the bottom right hand corner proclaims: “The southern area was measured by Policlito”, while just across on the bottom left hand side within a mirror image right angled box is broadcast: “The north and west were measured by Teodoco.” How incredible is this that depicted on this map we actually have the names of three of the four men being the chosen surveyors that produced Caesars’ Survey of the World by 13/12 BC!!! Even more invigorating is that the cartographer has penned a scene at the bottom left hand corner of the map which depicts three of the four men receiving their written instructions under seal from Caesar Augustus himself (see Figure 5). We know this because the names of three of our four Surveyors are written in black text alongside their figures - Nichodoxus, Theodocus and Policlitus. Upon the sealed document the instruction reads: “Go into the world and make a report to the Senate on all its continents: and to confirm this [order] I have affixed my seal to this document.” The seal of the emperor, Augustus Caesar, hangs from the paperwork while the outstretched hand of what may be Nichodoxus touches the end of it in preparation for its receipt. Such theatre is the province only of the map’s creator since it was not until 26 BC that Octavian was installed as Caesar Augustus by the Senate making such an event at odds with that depicted as a showpiece on the ecclesiastical map. The further inscription above the figure of Caesar Augustus is an unlikely reinforcement of this action from the Gospel of St. Luke which relates the following: “Luke in his Gospel: There went out a decree from Caesar Augustus that all the world should be described” which is an obvious attempt to offer Biblical recapitulation for this significant historical event, but once again this reference is to a second taxation census and not the subject of the original Survey of the World. Whatever reasons motivated the two great Roman Emperors to order a Survey of the World have been postulated by eminent cartographic researchers possessed of much more ancient knowledge than myself but the fact that it WAS done is not disputed. Through this ancient action the Survey of the World has been immortalized along with “the four very wise and chosen men” who completed the assignment. flat AND round just like our Hereford Mappa Mundi?!? I would also like to express my sincere appreciation to our Italian colleagues who are staging this FIG Working Week and History Workshop during a time of serious economic and social uncertainty. Grazia! Library: Toronto: University of Toronto, 1996). Hodgkin, Thomas, The Letters of Cassiodorus, (Oxford University Press, 1886). Private land surveyor since 1973, Bachelor of Surveying (UNSW 1978), MA (Egyptology) from Macquarie Uni., Sydney (2000). Now Director of Brock Surveys at Parramatta (near Sydney). Papers presented worldwide inc. Egypt, Germany, France, Hong Kong, Canada, Brunei, New Zealand, Greece, UK, USA, Israel, Sweden and Morocco. Since 2002 regular column Downunder Currents, in RICS magazine (London) Geomatics World. Dedicated contributor to FIG Institution for the History of Surveying and Measurement awarded FIG Article of the Month March 2005 for paper “Four Surveyors of the Gods: XVIII Dynasty of New Kingdom Egypt (c. 1400 BC)” Institution of Surveyors NSW Awards – Halloran Award 1996 for Contributions to Surveying History and 2002 Professional Surveyor of the Year. First international Life Member of the Surveyors Historical Society (USA), Life Member Rundle Foundation for Egyptian Archaeology, Foundation Member Australian National Maritime Museum and Friends of the National Museum of Australia. Member of International Map Collectors Society, Royal Australian Historical Society, National Trust of Australia, Historic Houses Trust of NSW, Parramatta and District Historical Society, Hills District Historical Society, Prospect Heritage Trust and Friends of Fossils (Canowindra).